Freelance writer Emily Stott, who worked for Northern Life before continuing her career in the South of England, is taking a six month trip travelling to the USA, South East Asia and India. She will be writing about the next leg of her trip to India in the next edition of Northern Life. In the last edition I had just finished a road trip of a lifetime in the USA, and from here we arrived in Indonesia. With navigating squat toilets, the chaotic roads and learning to sleep through the loud call to mosque in the early hours of each morning, it was a bit of a culture shock at first. But such an amazing place! We spent the next three weeks island hopping to enjoy idyllic beaches and climbing up volcanoes and deep into sulphurous craters. From here we spent a week soaking up the surreal city atmosphere in Hong Kong, and then onwards to Vietnam where we stayed from January 1-30. Our first stop was Hanoi, a bustling city and a great introduction to a friendly but rather hectic (in a good way) country. Highlights included a macabre visit to Hoa Lo Prison, which was built by the French after they invaded Vietnam in the 1800s, and held political prisoners in terrible conditions, and later American prisoners of war. Our next stop was Ha Long Bay, a natural wonder that has, I hate to say it, now become just another huge tourist attraction. Don’t get me wrong, the views of the giant limestone peaks jutting up out of the water through the fog was a sight to behold but the hundreds of boats cruising through there each day dumping their rubbish into the water was an unpleasant distraction. It’s saddening that tourism could actually be the death of such a beautiful sight. From here we took an overnight sleeper bus, where we were cramped together on a 12-hour ride up into the mountains of north Vietnam. The journey might have been hair raising with little sleep but our destination, the beautiful Sapa, was well worth it. With breath-taking views of the mountains from the hostel and a quaint and quiet town to wander, it was the perfect place to set out into the countryside and really see Vietnam away from the cities and busy tourist areas. We hired a local guide to take us into the mountains for a walking tour. Mai was from the Hmong tribe living in nearby Lao Cai. She took us to the protected hillside tribes and villages on an unbelievably scenic route. 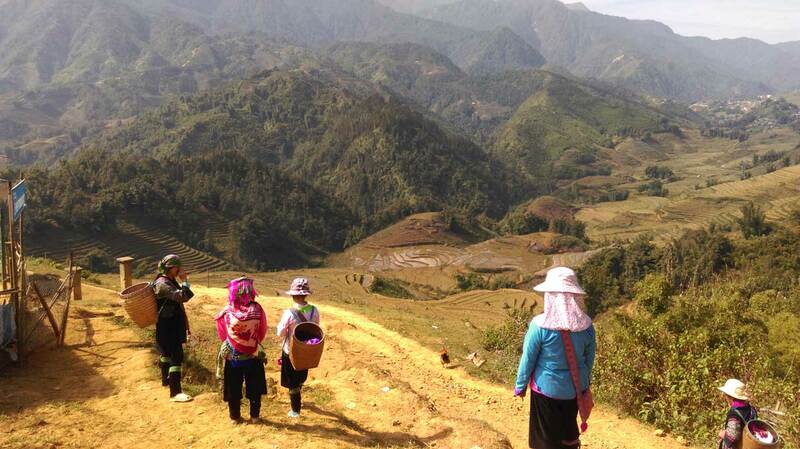 Rice paddies adorned the mountain tops and small villages popped up out of nowhere. On the way we were joined by her friends and neighbours who were heading back to their village and were keen to chat to us about our lives and theirs. While we undertook the hike in trainers or walking boots, these women donned little sandals, with tiny babies, or heavy goods strapped to their backs, and took the mountainous trek in their stride – just another day in their lives. The walk took around four hours and meant we had the opportunity to see some amazing views and learn about the traditional Vietnamese people, far removed from the rest of Vietnam or even the rest of the world. Our next stop was Hue, a historic former capital with an impressive walled citadel at its centre. And it was here that the rain first started. 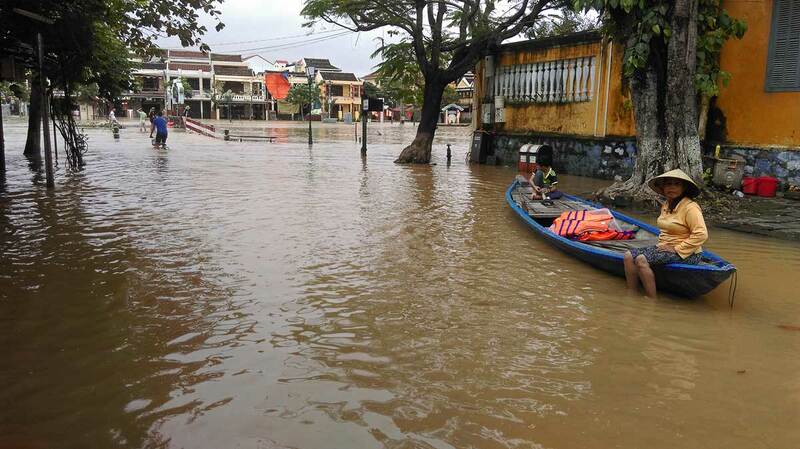 After arriving in the beautiful, old town of Hoi An and doing some sightseeing, the afternoon was cut short by the torrential rain that ensued. By the next morning the old quarter, famed for its ancient buildings and narrow streets, had been completely flooded by the river. Only half of the town was accessible on foot. Instead people rowed boats up and down the streets as if they had always been under water. I thought the rain would stop but by the next day parts of the new town was also flooded, and under deep water. Our street remained untouched but we were restricted in what we could do so we decided to get a bus out of town the very next day. That next morning, the hotel staff woke us to say if we wanted breakfast we would have to have it now because the hotel was about to flood. As we made it downstairs, bleary eyed, we could see that surrounding the hotel on both sides was a deep river, with the water just licking the top step of the entrance. The brown, murky water was a formidable sight, especially when you factor in the woman we spotted defecating into its depths. We were stranded with no buses able to navigate the flooded streets. By tea time, proving my commitment to filling my belly, we waded knee-deep into the water, then thigh deep and finally found a street which had not flooded where we could get food. By the next morning, we were desperate to leave, and luckily some of the water had subsided and we managed to get a bus out of there. Often people who have visited the ancient town describe Hoi An has their favourite place in Vietnam and I can see why it can be so charming. It was completely different to anywhere else we had been in the country, but for a UNESCO protected site it is such a pity that almost every year the buildings deemed so important to the country’s heritage are continually plunged under water and no help comes for the people living there. Small rowing boats cruise along streets that used to be full of traffic and shops and cafes have to close for business while homes and hotels battle to keep the water from flooding inside. It continued to rain as we moved on to Nha Trang, a usually vibrant beach resort that could now only be described as soggy, but the downpour finally stopped when we made our way up into the southern mountain region of Dalat. The lovely lakeside town boasts what I think might be my favourite house in the world, (maybe except mum and dad’s in Nelson) – the Hang Nga “Crazy House”. It was described to us as “like Barcelona’s Gaudi on acid” which is very fitting. If architecture interests you or even if it doesn’t, it is a fascinating must-see place. The Crazy House is made up of labyrinthine curving walls, there are surrealist animals in every room and staircases and tunnels intertwining and reaching dizzying heights. Our final stop in Vietnam was Ho Chi Minh, formerly known as Saigon, where we were to spend Christmas. The build up to Christmas had passed me by, not only being so far away from home and family, but I had also missed out on the usually inescapable festive hype. It was only as Christmas Eve started to fast approach that I felt like I was missing out on the holiday cheer that I love so much. Our hostel put on a Christmas buffet party to make us feel at home which I thought was very sweet but it wasn’t quite the same. In Vietnam, Christmas Eve is more of a celebration than the day itself and so the evening was the busiest, most hectic experience I have ever had in my life. The bars and restaurants of Saigon were packed, the roads were gridlocked with scooters and pedestrians and you could barely move for people. A strip that days before had been moderately full of backpackers was now teeming with locals celebrating in style. cheese and in that sense this year was like any other Christmas Day – just in 30 degree heat. Then it was back to exploring, with a trip to the famed Cu Chi tunnels, where Viet Cong soldiers hid from and fought back against US soldiers in the Vietnam War, and the Mekong Delta – a beautiful maze of waterways amidst a vast, green jungle. We also visited the War Remnants Museum which was a harrowing experience detailing the atrocities of “the American war” as it is known in Vietnam, and the long-lasting effects of Agent Orange. As horrible as some of the pictures and details were, I would thoroughly recommend the visit to really understand Vietnam’s past and what the people there have had to overcome. It is an unforgettable country and when we crossed the border into Cambodia just days ago, I was sad to say goodbye.